Why fit in when you were born to stand out? Be YOU…because YOU are beautiful! It has been a long time since I have posted here at beyoutifulmom, but I wanted to share this post that I wrote for #WORDNerdWednesday over at My Messy Desk. Come read with me about the word Temple. The word “temple” has several different meanings and all are worthy definitions for exploring. In context and how the word is properly defined all depends upon what you are reading or the meaning that you are seeking. The general definition of the word “temple” according to a quick Google search is a building devoted to the worship, or regarded as the dwelling place, of a god or gods or other objects of religious reverence. i.e., house of God, house of worship, shrine, sanctuary, church, cathedral, mosque, synagogue, shul, or archaic fane. However, to the believer and follower of Jesus Christ, the word “temple” takes on a much grander meaning. Jesus Christ was of Jewish decent and to the Jewish people, the temple was physically represented by two successive religious buildings. The first temple was built by Solomon in 957 BC and later destroyed by Nebuchadnezzar in 586 BC. This particular temple contained the famous Ark of the Covenant. It was also the actual dwelling place of (Yah-God). There is also some mention of the temple being rebuilt by Zerubbabel in 520 BC. Zerubbabel was the head of the tribe of Judah at the time of the return of the Babylonish captivity, during the first year of Cyrus’ reign. It is probable that Zerubbabel was in the King of Babylon’s service and like Daniel, received a different name. Since we have very few particulars or physical evidence to realize the temple’s appearance, we tend to focus on the temple when it had strongly laid foundations. Rather than seeing three different temples, scholars focus on two particular temples with modifications being made to pre-existing foundations. The second temple (515 BC – AD 70) was enlarged by Herod the Great and later destroyed by Romans during the Jewish Revolt. It is said and often believed to have been built by Herod just to appease the Jewish people and to gain their favor. Today, all that remains of the temple is the western part of the wall (a few stones) and an inner gate. Current ruins indicate that levels of the foundations possibly laid by Zerubbabel and Solomon are still noticeable but not built up. The physical evidence of the temple helps us to put pieces of Biblical history together and perhaps this may be the reason why there is still a focus on the history of the temple and why the Jewish people are waiting for it to be rebuilt again. Since the word “temple” is mentioned over 600 times in the Bible and with this word being mentioned so much, it is important that we understand what is meant when we read the word temple both in the Old and New Testaments of the Bible. The Old Testament use for the word temple is bayith (Hebrew) which literally means house, household or home. Heykal (Aramaic) is also found in the OT and means palace. The New Testament uses the Greek word eidolon which means idol’s temple and the word noas which means shrine. Recently a group of us went downtown and participated in a game where we were locked in a room, given a couple clues, and asked to figure out how to escape the room in order to break free (yes, we actually paid our own hard-earned money to be locked away). As we solved certain clues, more rooms and details were opened up to us. We had one hour to solve the mystery and break out of the final room. If the group was successful at beating the game, we would be given a sticker and the right to purchase a shirt that said “I Escaped!” on it. If not, each member of the group would receive a sticker that said “I Almost Escaped!” on it. Before our team started the game, we were able to see several teams come out of their game room. Some were celebrating in jubilation while others seemed bummed out that they didn’t have enough time, clues or the ability to beat the game. This modern day game requires the ability to think logically, be quick on your feet, and work in an orderly fashion. The clues become progressively more difficult as time goes along; and just when you think that you followed all the rules and solved the problem, another room opens up and a whole new set of clues are revealed. This same exact game concept can be applied to understanding the final book of the Bible. Revelation, one of the most prophetic books in all of the Bible, is like a syllabus: a course outline of what is to come. Clues from all throughout the Bible are read and uncovered, and the story of what was, is, and is to come, plays out in an apocalyptic epistle. What is first discovered is that the kingdoms of this world are currently under the enemy’s rule, but they won’t always be. The last trumpet will be blown and heard, which will then signal the Lord taking reign of the Kingdom. He will rule and reign forever. There will be a glorious proclamation of victory for The Church (The Bride of Christ). True worship of the King will be established, and instead of receiving a sticker like you do when you beat the game, a celebration of jubilee will take place. Nonstop praise with a resounding hallelujah will occur. Never-ending gratitude will be offered and the complete victory of God will be fully realized by all. Just as the twenty-four elders in the book of Revelation prostrate themselves in worship and give thanks for the One who was and is to come, we too can get in the habit of thanking the Lord God Almighty. Gratitude starts with a jubilant heart. Sometimes all we need is a friendly reminder to not be a sour saint or a grouchy Christian. Here are a few steps we can take towards possessing a happy heart. Have you ever stopped and taken time to wonder what it will be like when we finally get to see Jesus face-to-face? I often wonder, I really do. I wonder will we be taken by His presence and want to worship Him or perhaps will we just want to thank Him for all His goodness, His grace, His mercy and His love, among the many other great things that He has done for us? Worshiping the Lord and giving thanks are virtuous practices. Both are outward expressions toward a loving and gracious God who deserves our affection, our attention and our gratitude. However, both are unnatural practices in the sense that they don’t come to us instinctively, mainly because of our carnality. We have to put them into practice and make them a daily and consistent part of how we live our lives. While keeping this in mind, God always works something for the greater good and even out of our presumable bad circumstances. The plan He has for us always considers His kingdom and eternity. If we belong to His Kingdom, then we can rest while being assured that He has gone before us and has worked on our behalf to cause good to come from our less than desirable circumstances. This is most certainly reassuring because it helps those of us who tend to worry, not to worry, and therefore, we begin to let an all knowing God move and work on our behalf. The word “faith” in Hebrew, the language of the Old Testament, has no less than five word translations. Some of the most notable translations from the Old Testament are amen, batach, chasah, yaqual and quwah. While noting that the Hebrew language uses words that are designed to help form mental pictures, faith is most commonly seen as amen which means to believe, to put your trust in or to lean on Yahweh (God) for support. The Greek word for “faith” in the New Testament is pistis. In the Greek language, the word faith is not limited to a mental asset or to believing certain ideas. The single word faith encompasses all of the following words: faith, faithfulness, reliability, promise, pledge, proof, trust, confidence, the act of believing, the content of “what” is believed, all that the gospel stands for, what is given evidence to and the system of doctrine or morality particularly referring to the Christian faith. There are over 475 instances within the English Standard Version of the Bible where the word faith can be found. It can be seen from the very first page of the Scriptures, appearing numerously, all the way until the last page of the Bible. Let’s look at the meaning of faith a little further. Faith can also be defined as trust, putting our trust or our belief in the promises of God and His Word. Leaning on God for support. Faith is a requirement for every person who believes in the LORD, His Son Jesus, The Holy Spirit and the Bible. In fact, a person cannot approach God without faith in His Son Jesus Christ. Nonetheless, neither can a person please God without faith in His Son Jesus (Hebrews 11:6). Faith is a covenant word. Meaning in order to understand it, we also have to see faith in terms of relationships. Our commitment, our trust and our human reliance on a reliable God binds together to form a covenant between humanity and The Most High God. God shows Himself faithful and people respond with faithfulness. God by His grace makes a promise and then commits Himself to His people. To say that you have faith, is to bind yourself to that which you have faith in. Keeping in mind that when you profess to have faith, it does not say much about you, but rather it says so much more about who or what you have faith in. God is a trustworthy God and He uses faith as the instrumental cause of salvation. Faith is a free and unmerited gift from God. (Ephesians 2:8) It comes by hearing it and hearing it comes by the Word of God. (Romans 10:17) Therefore, faith is to be regarded, protected and established for the sake of spreading the gospel. Faith, but not only faith…….there is a difference between having a form of faith only and having a saving faith. The Bible tells us that even the demons believe and confess that Jesus Christ is Lord. (James 2:19). A saving faith is to not only believe, but to also put your trust in Jesus Christ. Belief and trust must go together to have authentic saving faith. Please finish reading this post at: creativeinspirationsatmymessydesk for today’s #WORDNerdWednesday. Jeremiah 29:11 is such a popular verse amongst many believers. It is read, liked and held onto because of what it declares. People are encouraged and naturally want to believe that God has great things in store for them. They also want to believe that their future is going to be filled with hope and look ever so bright. After all, isn’t optimism the route to being a more positive person? However, this verse is one of the most misused and misquoted verses in the entire Bible. It requires that we dig a little deeper and read it in context of what is happening both historically and spiritually during the time of its origination. The prophet Jeremiah has a message for the exiled Judeans. The message is presented around 597 BC while the Judeans are being held captive in Babylon. The exiled community is under judgement due to their ever growing sinful ways and God’s backslidden people are being called to live amongst the heathens as a witness of God’s grace. Jeremiah tells the people that after 70 years of exile, they will return to their own land. This will all be the accomplishment of God as His people seek Him, turn back from their wicked ways and love Him and Him alone wholeheartedly. Not only will God bring back those who are exiled but He will also bring back those whom have been scattered elsewhere. This particular prophecy is one with fulfillment to come both in the long term and in the short term. The long term fulfillment refers to Christ coming back for the nation of Israel and the short term deals with the time period around 597 BC. Further, around the time of 597 BC, Jeremiah tells the people to settle down where they are at, he also tells them to not listen to false teaching or false prophets, and that their wait will be 70 years. God is thinking of them. The future of God’s people in exile rests on God’s gracious promise. His promise is plans of prosperity and “shalom-peace.” This plan is predicted based only on the people turning away from their wicked ways, seeking God with their whole heart and turning back to their first love. Fast forward to today and we see that Jeremiah’s prophecy bares the same message just with a slightly different bent based on our current times. 1 John 4:16 says “So we have come to know and to believe the love that God has for us. God is love, and whoever abides in love abides in God, and God abides in him.” This Scripture tells us exactly how He feels about us. God loves us! Since we know that God loves us so much and abides in those of us who put our faith in Him, we can also follow the same line of thinking shared by the prophet Jeremiah. He has plans for us, plans to prosper us, not harm us, and plans to give us a future and a hope. But this does not mean that God is a vending machine and is going to give us what we wish, when we want it. God, in His divine holiness and incredible love for us, created us to be His greatest masterpiece. He knows what we need and has plans for us that go far beyond what we could ever hope or imagine on our own without Him. This is why we can trust that He has our greater good in mind. As we read the words of Jeremiah, let the assurance of His words sink in. This blessed promise still holds true today even though we are not currently a people in exile. 2,600 years later we can still read this verse and cling to the words of the prophet, all while keeping the correct context in mind. For He knows the plans He has for us. Plans of a great future spent with His Son Jesus. There is no better promise to hold on to. Be blessed by this assurance friends. Birds are fascinating little creatures. They fly, sing, peck, hunt, gather, swim, soar, build, protect and war. Not to mention, they do all things while looking more beautiful than ever and without ever even complaining. Just how intriguing are these little creatures? Birds have been created with a purpose and are faithful to their calling. Have you ever conducted a search or studied the word “sparrow?” There are so many different types of sparrows that you could read and learn about them for days and never run out of new birds to learn about or study. One might think after conducting a search on them, that the word sparrow is just another word for bird. But this is simply not the case. Sparrow is only one species in the taxonomic or taxonomy order. There are hundreds and thousands of different types of birds. Just within the sparrow family alone we see some of the following different types: old world sparrows and new world sparrows, Green-backed sparrows, White-eared ground sparrows, Black-striped sparrows, Clay-colored sparrows, Field sparrows, Vesper sparrows, Large-billed sparrows, Seaside sparrows, Fox sparrows, Grasshopper sparrows, Swamp sparrows, Dark-eyed Junco sparrows and the list could go on… with not even coming close to all that is encompassed within this species of the Passerine Order.….. In our imperfections, we humans tend to follow the line of thinking and believing that since there are so many types of sparrows, when one goes missing; it is not missed or valued. If we are not careful, that same train of thought or line of inner reasoning carries over into the way we see and feel about ourselves. We must remember though, this is not the case with God. God does not value humans the same way that we humans value each other or ourselves. If the Lord could be so detailed in the creation of just one species of bird, how much of more value has He given to us that which He created in His own image? God’s divine guidance and care reaches and extends to all creatures; all their actions, including every minute detail. Humanity, being His creation is indispensable. We humans are God’s greatest masterpiece, created in His image to do good works. Knowing this full well and up front is good for all, especially for those who put their faith and trust in His Son Jesus Christ. Other creatures were made for man and put under his feet (Psalm 8:6-8), but the disciples of Jesus Christ are the excellent ones of the earth. Jesus loves us. While not forgetting that our parents love us and nurture us, they, in all their love, do not even come close to the love Jesus has for us. Jesus knows how many hairs we have on our head. He knows our inward thoughts and innermost being. He loves us so much that He died in our place. Rarely is one willing to do such a thing. Yet, Jesus sought forgiveness for those who persecuted Him as He took our place, petitioning the Father on our behalf for the forgiveness of our sins. He is reliable. He values us greatly. Lastly, there is a command written at the beginning of Matthew 10:31 which are two important words for all believers. “Fear not.” Don’t be afraid. Trust God. There is enough doctrine of God’s providence to silence every fear of God’s people. (Psalm38:12-15; 64:4,7). We are called to adhere to the command. God is trustworthy. He cares for us deeply and can be trusted always and without reservation. If He can be trusted with the care of an entire species of birds, how much more can He care for those He created most like Himself! Our value is worth so much to our Lord. It always has been and always will be. Let us not take one single breath, moment or day for granted. Because He pays such attention to detail, I know and understand my true worth. What are you worth? May you know that you are of more value than many sparrows. The word Jew is short for Jewish and is the name derived from the patriarch Judah, which was first given to those belonging to the tribe of Judah. Further it is a name given to the separate kingdom of Judah in contradistinction from those belonging to the kingdom of the ten tribes, who were called Israelites. The history of the Jewish nation is entwined with the history of Palestine and follows the story of the lives of their rulers and chief men. Jews are now dispersed over all lands, and to this day, they remain a separate people, without a king, without a prince, without a sacrifice, and without an image (Hosea 3:4). Till the beginning of the present century, they were everywhere being oppressed, and often persecuted; but now their condition is greatly improved, and they are admitted in most European countries and have received all the rights of a free citizen. The Jewish population in all is estimated at about six million, with about four million being in the country of Europe. It has also been said that the United States holds a high population of this group, with Israel following next and then Russia. Many Jews have come to the United States seeking freedom from religious persecution that takes place in many other countries. According to the Scriptures, we do know that someday the Jews will begin to make their journey back to their original homeland before exile. Why you may ask? Simply put, Christ is coming back. There will be a restoration of Israel which includes both the Jewish and Gentile people. Isaiah 49:16 (ESV) says “Behold I have engraved you on the palms of My hands; your walls are continually before Me.” This Scripture alone and when studied on a deeper level reveals a poem that encompasses a mixture of questions asked by those of Zion. The poem in Isaiah 49 goes on to reveal a discourse of Christ being introduced to the world. We see prophesy being fulfilled and salvation inhabited through the Suffering Servant Jesus Christ. About the Artist: Lindsey Keith is a 17 year old Junior who LOVES God, her family, dance, Art and horses. Lindsey can be found doing the typical teenage stuff like volunteering or babysitting when she is not creating beautiful Art. She volunteers at church and a therapeutic horse ranch. She is honored to have achieved being on the California Scholarship Federation each semester of her high school career and has received straight A’s during her schooling adventures. Lindsey’s goal at this point in her life is to receive scholarships to be able to attend a Christian University after graduating High School. Her talent on loan from God is exuberant in extraordinary ways. 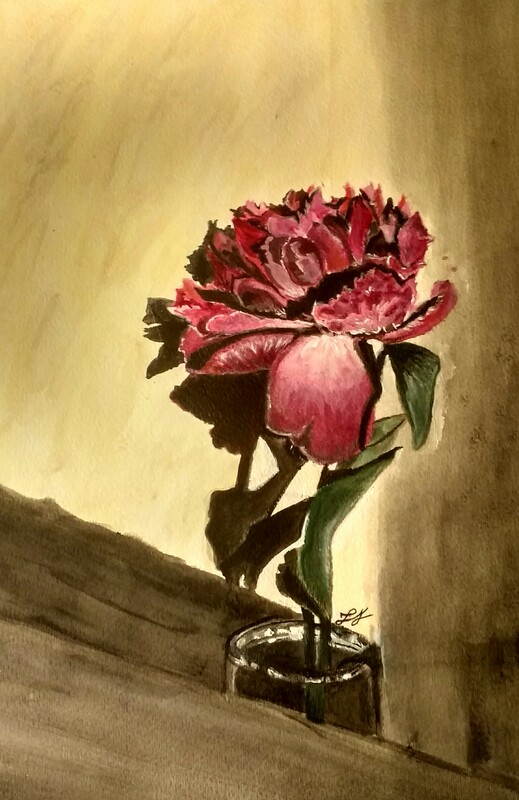 I absolutely love that she finds time to create beauty right where she is. Way to go Lindsey! Righteous – an adjective referring to a person or conduct; meaning morally right, justifiable or virtuous. The informal definition of righteous is very good, or excellent. The base word of righteous is right. Adding eous to the end of the base word enables the word to mean from that which is right. mā·shär’) and also in the New Testament, Greek as (dē’-kī-os). The number of times the word righteous appears in the Bible depends upon the selected version of the Bible. The English Standard Version has righteous listed 267 times. Ezra the High Priest wrote “O Lord God of Israel, thou art righteous” Ezra 9:15a (KJV). The Psalmist declared “Gracious is the LORD, and righteous; yea, our God is merciful.” Psalm 116:5 (KJV). On their website, Blue Letter Bible has a list of the attributes of God. The list says the following “Righteousness is similar to goodness and holiness, but differs in that it requires works to establish it. Something (like Adam) can be holy, but not righteous if good works do not accompany it. God is good, but He refers to Himself as righteous because He works the good as well. Christians are called righteous, not because they have any ability to accomplish good works, but because they reside in the good works (or righteousness) of Christ. Christ’s obedience is transferred to us and God grants us eternal life as a result!” Aren’t you thankful that Christ’s righteous ways are transferred to those who put their faith in Him? We become righteous because of Christ’s righteousness. His righteousness is one of the attributes that set Him apart from everything else. The gospel reveals that the good news of Jesus Christ supports God’s righteousness. Reading through the books of Matthew, Mark, Luke and John are enough evidence to see and establish the righteousness of Yahweh. Not only is God the Father and His Son Jesus Christ righteous, but they always do what is right. We can fully rely on them because of their righteousness. They are trustworthy to exhibit true righteousness in all manners and in every circumstance. I am not sure about you, but knowing this full well and upfront causes me to continuously put my faith and trust in them. So far we see and have established that God is righteous, He deals in righteousness and He is reliable because of His righteousness. Now, we must consider the opposite of righteous in order to get a fuller picture of what righteousness entails. God rewards righteousness by exposing that which is evil. In short, He loves the things that are good and hates the things that are evil. He calls all that follow Him to do the same. We as believers are called to love and cling to what is good and shun that which is evil. Don Stewart, the Bible explorer says “God’s righteousness, or justice, is an attribute that leads Him to do only those things that are right. Because God is righteous, He must judge evil. God’s justice allows Him to reward those who have been faithful to Him. Someday He will rule in absolute righteousness.” 2 Timothy 4:8 (ESV) says “Henceforth there is laid up for me the crown of righteousness, which the Lord, the righteous judge, will award to me on that Day, and not only to me but also to all who have loved his appearing.” The acts of the wicked will be shown for what they are. 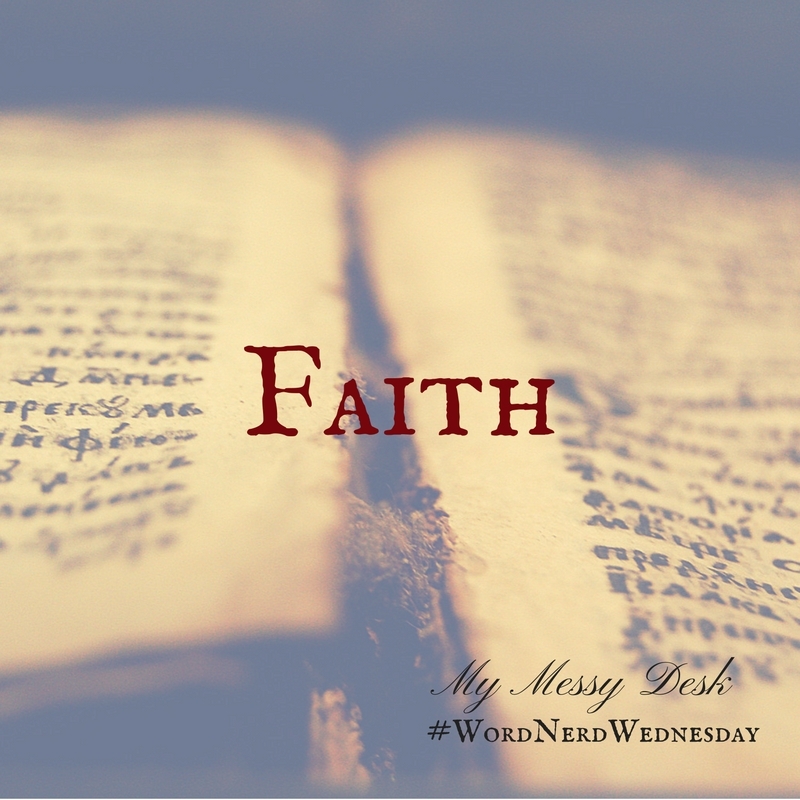 Hello Friends, I am guest posting today for #WORDNerdWednesday over at My Messy Desk. Come read with me. Consecration – kon’-se-krat, kon-se-kra’-shun– (noun) the solemn dedication to a special purpose or service, usually religious. The word consecration literally means “association with the sacred.” Persons, places, or things can be consecrated, and the term is used in various ways by different groups or religions. For example, the word “consecration” is used in the Catholic Church as the setting apart for the service of God of both persons and objects. In the nondenominational church, “consecration” is viewed with more of a focus on the person rather than on their service to God. This is seen in the purifying of oneself (sanctification). Separating oneself from the world and devoting oneself to God. Two things are applied here. First that man separate himself from evil ways and companions so that he is fully devoted to God, second that God separate guilt from the conscience, sin from the soul and all in order to make a man internally and externally holy. Old Testament – In the Old Testament Bible, we see the consecration of the the Hebrew High Priests (Exodus), we also see the consecration of the Levites and Nethinim – the temple assistants (Numbers). Further, we see the Consecration of the Altar. Exodus 29:37 (ESV) says “Seven days you shall make atonement for the altar and consecrate it, and the altar shall be most holy. Whatever touches the altar shall become holy.” The place that offerings were brought to and sacrificed on, was called to be set apart and made holy. Lastly, we also see theThreefold Sacrifice of Consecration in the offerings brought to the altar (sin, burnt and peace offerings). It is easy in the times we find ourselves in to go to church and be “Sunday Christians.” Life gets busy and so many other things take over our schedule. We stop making time for God and blame it on our busyness, duties or roles in life. However, 1 Peter 2:9 reminds us that not only are we chosen, but that we also have a reason for that which we are called to. We can no longer look or act like we use to. Since we have been made different, renewed and in the image of Christ, we are called to stand out, be set apart and make a difference right where we are at. Consecration begins with dedication and ends up with a person possessing the mirrored image of Christ in their daily life. More time is spent on becoming who Christ desires them to be and less time is spent on one’s own personal agenda, likes and desires. This is a true picture of consecration. There is a growth toward maturity that is required as one becomes consecrated to the Lord. In fact, that growth and maturity is evidence of a true believer. People notice a difference. A true believer stands out, they do not fit in with the norms of the current culture. They adhere to what the Lord teaches in His Holy Word. This is much, much different than the current world system of today’s day and age. Have you ever been so busy that you barely have time to stop and take care of yourself? Well, this is where I am currently at! It has been one the busiest seasons of my life. I can only recall a few other times in my past where I have been this hard-pressed! I am grateful though for every moment I have been given. “To whom much is given, much is required” (Numbers 18). Even though I have been occupied with many daily tasks, the Lord has carried me through each step of the way. He has reminded me of why I am here and what I have been called to do, all while giving me such a peace that surpasses my own understanding. Today I am grateful for His grace, mercy and His love. Reading this passage from Ecclesiastes has encouraged me to keep on going even when I feel like giving up or giving in. May it encourage you as well in this season of your life and may you be blessed knowing that this life we have been given is a true gift from God. May we not take one single day for granted. What have you been tasked with lately? What I have been up to this week: Come Read With Me……..
Hello, I am Misty here at beYOUtiful Mom. My prayer for all that come along and read here is that you would be blessed, encouraged and uplifted. Also, that you would find a place where you know that it is okay to stand out, in view of the fact that the Lord made you uniquely you!